2009 Yılı Internet Sayıları (İngilizce) | Yazılar | Dev..
90 trillion ? The number of emails sent on the Internet in 2009. 247 billion ? Average number of email messages per day. 1.4 billion ? The number of email users worldwide. 100 million ? New email users since the year before. 81% ? The percentage of emails that were spam. 92% ? Peak spam levels late in the year. 24% ? Increase in spam since last year. 200 billion ? The number of spam emails per day (assuming 81% are spam). 234 million ? 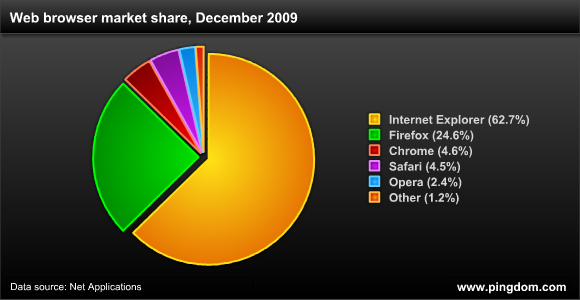 The number of websites as of December 2009. 47 million ? Added websites in 2009. 13.9% ? 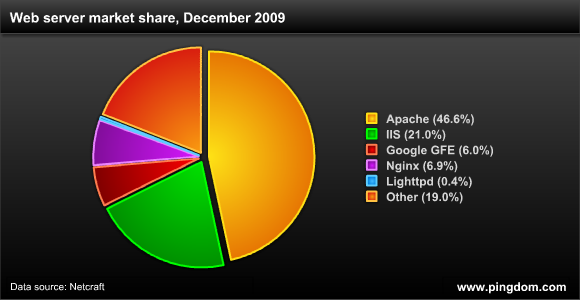 The growth of Apache websites in 2009. -22.1% ? The growth of IIS websites in 2009. 35.0% ? The growth of Google GFE websites in 2009. 384.4% ? The growth of Nginx websites in 2009. -72.4% ? The growth of Lighttpd websites in 2009. 81.8 million ? .COM domain names at the end of 2009. 12.3 million ? .NET domain names at the end of 2009. 7.8 million ? .ORG domain names at the end of 2009. 76.3 million ? The number of country code top-level domains (e.g. .CN, .UK, .DE, etc.). 187 million ? The number of domain names across all top-level domains (October 2009). 8% ? The increase in domain names since the year before. 1.73 billion ? Internet users worldwide (September 2009). 18% ? Increase in Internet users since the previous year. 738,257,230 ? Internet users in Asia. 418,029,796 ? Internet users in Europe. 252,908,000 ? Internet users in North America. 179,031,479 ? Internet users in Latin America / Caribbean. 67,371,700 ? Internet users in Africa. 57,425,046 ? Internet users in the Middle East. 20,970,490 ? 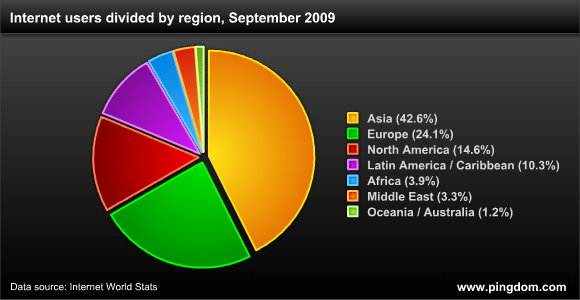 Internet users in Oceania / Australia. 126 million ? The number of blogs on the Internet (as tracked by BlogPulse). 84% ? Percent of social network sites with more women than men. 57% ? Percentage of Twitter?s user base located in the United States. 4.25 million ? People following @aplusk (Ashton Kutcher, Twitter?s most followed user). 350 million ? People on Facebook. 50% ? Percentage of Facebook users that log in every day. 500,000 ? The number of active Facebook applications. 4 billion ? Photos hosted by Flickr (October 2009). 2.5 billion ? Photos uploaded each month to Facebook. 30 billion ? At the current rate, the number of photos uploaded to Facebook per year. 1 billion ? The total number of videos YouTube serves in one day. 12.2 billion ? Videos viewed per month on YouTube in the US (November 2009). 924 million ? Videos viewed per month on Hulu in the US (November 2009). 182 ? The number of online videos the average Internet user watches in a month (USA). 82% ? Percentage of Internet users that view videos online (USA). 39.4% ? YouTube online video market share (USA). 81.9% ? Percentage of embedded videos on blogs that are YouTube videos. 921,143 ? The number of new malicious code signatures added by Symantec in Q4 2009.